The researchers used Transcranial Magnetic Stimulation (TMS) to indirectly stimulate activity in the hippocampus, a key part of the brain involved in the storage of memory. Those of you who have some understanding of how TMS works may be surprised that TMS stimulation can affect function of the hippocampus. After all, TMS stimulation affects only the superficial part of the brain (the neocortex) and the hippocampus is part of the limbic brain, the deepest part of the brain. The authors then demonstrated that this hypothesized connection between the lateral parietal cortex and the hippocampus was real by using functional MRI scanning to show that stimulation of the lateral parietal cortex specifically enhanced activity in circuits in the hippocampus. Then they tested whether this allowed them to affect hippocampal function by stimulating the parietal cortex. 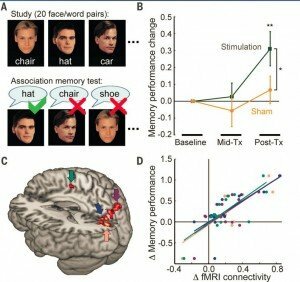 This study not only shows that the hippocampus plays a central role in human memory but opens a window on an exciting new approach to enhancing memory in humans using a safe and non-invasive brain stimulation technique.